Are you searching for a gun safe but having difficulty deciding what to buy? 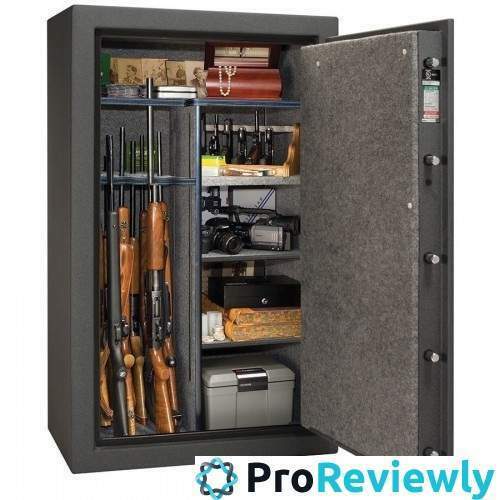 I have put together the best gun safe review to help you. It took quite some time to gather all the information I needed to create a great and in-depth review. Let’s get started so you can take a look at my comparison table, detailed reviews and buyer’s guide. I chose the Verifi because it offers a lot of value, easy to use and does an outstanding job in securing your handguns. If you want a pistol safe that prevents unauthorized people from getting to your firearms, the Verifi is the one to get. The Stealth gun safe is perfect if you’re on a budget but still want a high quality gun safe. With its ingenious design you can have up to three handguns always ready. It also has a nice drop down door for quick access. The AMLD593924-blk has room for up to 39 rifles, comes with 18 deadbolts and is made of 9 gauge steel. The safe has a 1/4 inch door drill plate and the hard plate is resistant to drills and ballistic. It’s also fireproof for 1875 F for an hour. What more could you want? Barska is well known for their quality products and this is no exception. With space for 4 riffles and superior biometric protection, you have assurance your guns are safe. What’s more the safe offers great value for your money. The Verifi Smart Safe is equipped with an FBI fingerprint sensor so it opens only by your finger’s touch. No need to memorize long numbers or find lost keys. Just record your fingerprint on the scanner and you’re done. The safe is secure and opens only when you touch the scanner. Its FBI silicon sensor utilizes a 3D imaging system to record your prints. It is also equipped with Anti-Spoof Liveness detection to secure your firearm. The sensor itself uses TouchChip TCSI technology which is superior to the fingerprint scanners used ordinary gun safes. With its Nite Light, the safe produces a low light so you can see the interior. This means you don’t have to grapple in the dark to find your gun. You can control how long the light is on and can also turn it off. The Smart.Safe has an auto lock feature that locks the door automatically when closed. It’s easy to forget to lock a gun safe when you shut the door or lid. With the Smart.Safe you don’t have to remember as it senses when the door is shut. The Smart.Safe has a health monitor that regularly checks itself for errors or problems. If the batteries are running low or there is another problem, it will be displayed on the LCD screen. With its Boost and Pico power, batteries last up to a year. Want to know if someone has been trying to access the safe? The Smart.Safe lets you know if there have been attempts to open the safe. Attempts at resets will be recorded and you’ll be notified. Measures (W)17.4" X (D)16.1" X (H)7.9"
The Stealth Security Box is built for protection and quick access to your firearms. With its distinct drop down door you’ll be able to retrieve your pistols quickly. The spacious interior allows you to store 2 pistols flat and 3 on the ready. The door has been fortified so it is now 3/8 inches thick and made of two solid pieces. With its spring loaded mechanism, the door opens quickly when you provide the proper combination. A speed reducing mechanism has been added to compensate for the door’s weight. The interior has foam padding to protect your pistols. The rods are also scratch resistant for enhanced protection. There is also an option to turn the sound off for silent operation. The silent mode should come in handy in case there’s a break in and you don’t want to make any noise. The safe has a soft red light that illuminates the inside. It is a nice feature that makes it easy to see your guns even in darkness. The light does not compromise its security features however. The safe meets the requirements of the CA DOJ and the body is made of solid steel. There is a reinforced lock hatch and anti pry tabs as well. The safe is also pick and straw proof so it cannot be opened easily. The lock housing has been welded as well. A security cable is included with the purchase of the safe, allowing you to secure it to a floor, wall or anywhere you want. Setting it up is easy too. The SentrySafe has a biometric fingerprint scanner for enhanced security. It stores up to 4 fingerprints so you can authorize other people to access the gun. Once the prints are recorded your gun will be secure. The QAP1BE uses compression gas strut so it doesn’t make a sound when you lift the lid. Not only is it quiet, but you can open the safe with one hand for rapid retrieval of your pistol. Aside from the biometric scanner there is a backup override key for emergency access. An electronic lock keypad with zero feedback is built in so it doesn’t make any noise when it is used. The emphasis on stealth is clearly one of its strong points. The security feature extends to the construction. It is made of solid steel and the door is pry resistant. Even with repeated attempts the gun safe won’t break easily. Made of 12 gauge steel, it conforms to the highest standards set by the industry. Inside the QAP1BE is soft lining to safeguard your pistol from scratches. There is sufficient space inside so the most common handguns will fit in easily. The safe measures 3.2"H x 12.0"W x 9.9"L while the interior is 2.2"H x 9.7"W x 6.6"L. With that much space you’ll have no problems with capacity. The holes at the bottom lets you mount this on the floor or shelf. All the necessary hardware are included. Like other SentrySafe gun safes, the QAP1BE biometrics is easy to program and use. The gun safe meets the requirements of the CA DOJ and that should tell you a lot about its quality. The VT20i has been upgraded from the previous model and now has stronger security brackets for better protection. The safe also has fortified mounted hinges, 2-point anti impact latches and anti pry bars. The gun safe has interior low LED light so you can view the interior day or night. The illuminated backlit keypad simplifies use in low lit areas. The VT20i is equipped with rechargeable lithium ion battery that’s good for up to 8 weeks. Charging takes only two and half hours via its USB. The safe is built out of 16 gauge, powder coated carbon steel. This makes the VT20i resistant to corrosion and rust and better equipped to protect your gun. While the safe is built mainly for gun storage, you can also use it to protect documents, cash, jewelry and other valuables. The safe provides two access points, via the biometric fingerprint scanner or the electronic backlit keypad. Ether one is easy to use so you’ll be able to retrieve your gun quickly in any event. The biometric fingerprint scanner records up to 20 different fingerprints, great if you want to let other people have access. Two manual override keys are provided for emergency access, and it is equipped with smart safe technology for protection. The VT20i can also be accessed remotely via your mobile phone. Using your smartphone you’ll be able to turn the hotkeys on/off, check for tampering signs, read your safe history and monitor power levels. Along with the rechargeable battery, an AC power adapter is also included. 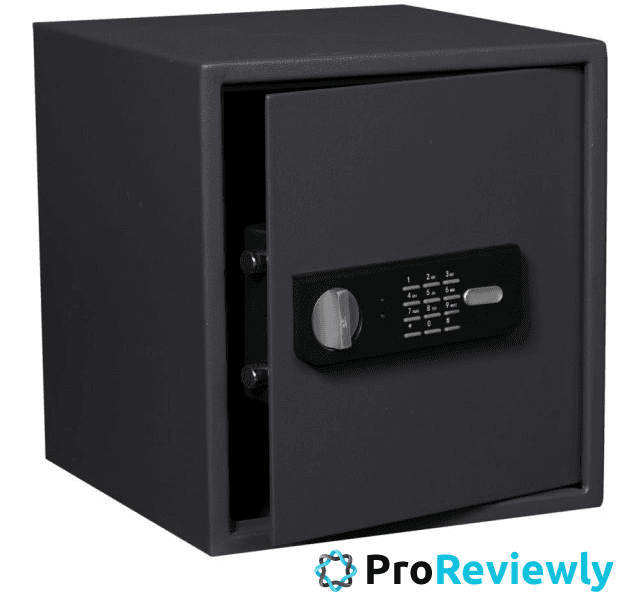 The safe is 11.0" wide X 5.75" deep X 2.0" tall. The SVB500 is designed to keep your handgun safe and in a secure location. Its unique design means you can store it anywhere at home or the workplace. Unlike other gun safes, the SVB500 is compact and can be discreetly mounted anywhere. Its biometric scanner stores up to 20 different fingerprints. You can limit access to just yourself, but it is also possible to give others access using the scanner. Recording fingerprints takes only moments and once done, the safe and your gun is secure. Aside from the biometric scanner, the SVB500 is made of 18 gauge solid steel. It is designed to be resistant to prying. A look inside the safe reveals that it has interior has foam lining to keep your gun safe. The SVB500 also has accurate fittings so it cannot be tampered with by hand tools. The SVB500i is also available in a combination version. This model has a digital keypad that makes it easy to enter the code and access your gun. It also has a rapid drop down door so once you’ve entered the code, it opens quickly. The SVB500 biometric and combination gun safes both come with backup override keys in case of an emergency. The SVB500 also has all the necessary hardware so you don’t have to buy any. The gun safe also has interior lighting so you’ll be able to see the inside even if it is dark. This if there is a break in, you don’t want to alert the intruder, so the low light is ideal in this situation. Whether it is at home or workplace, this unit delivers. Built to hold 24 to 39 guns, the AMLD593924-blk gun safe is for those who don’t want to compromise security. The 9 gauge steel body is complemented by the 5 inch, 3 layered fireboard door. There are 18 bolts in the safe, 11 active chrome plated and 7 inactive. Fry sides have bolts covering them, and the bolt and gear lock mechanism act as an anti tampering and anti prying protection. The AMLD593924-blk hard plate is ballistic and drill proof. Larger than those on other gun safes, it also acts as protector for the combination lock. There's also a re-locking bolt so you get added security. The door has an expandable seal. If there’s fire, it activates and protects your guns. It also keeps water out as well. Once you bolt the safe, the anchors provide extra security along with the metal plate. The interior has full upholstery to safeguard your weapons. The rack has 3 sections where you can store lots of rifles. There are also adjustable shelves where you can put pistols, ammo and other items. The door also has several more pockets, pouches and sleeves if you need more storage. The AMLD593924-blk has a couple of USB charging ports as well as 3 AC outlets included. The body also has black powder coating, giving it a smooth and durable finish. The AMLD593924-blk is a feature packed gun safe that’s going to keep your guns and gun accessories safe. At (HxWxD) 59 x 39” x 24” and 689 lbs it’s built for the task. The Barska AX11652 is for the gun owner who wants maximum security and protection. At the same time, the AX11652 makes it easy to access your firearms in case the situation calls for it. The biometric fingerprint system on the AX11652 stores up to 120 fingerprints, giving you complete control over the access. By recording your fingerprint, you only have to press the scanner and the safe opens. Now there is no need to memorize long combination and worry about lost keys. The AX11652 utilizes an advanced biometric module so the safe opens quickly. It also comes with an external battery pack and 2 backup keys for emergency access. The AX11652 measures 8.6in x 9.8in x 52.17in, while the interior dimensions are 6.3in x 9.7in x 52in. At 1.833 cubic feet, there is ample space for 4 riffles. There is also silent mode if you want to run the safe quietly. With sound or not, the AX11652 is easy to use. After your fingerprint is recorded, the data is kept in its database. When you try to open the safe, the AX11652 checks if your prints are among those that have been given access. If yes, the safe opens immediately. However it will remain closed if the fingerprint has not been given access. This is what makes the AX11652 secure. The safe has pre-drilled mounting holes so you can mount the safe for even more security. Thee door is pry resistant and is equipped with three deadbolts on the bottom, side and top for good measure. The GCB-910 from Stack On has a steel, welded box for enhanced security and protection. The lock has key coding and a three point locking mechanism made of solid steel. With space for up to ten guns, it is suitable for the long firearm enthusiast. The hinge is staked piano steel that’s been welded for enhanced security. It also has a no marring, contoured barrel rest that’s built specifically for long guns. The GCB-910 also has a nice black epoxy finish and also a flush mount bottom. The flush mount makes it simpler to secure the GCB-910 on a floor, and with its pre-drilled holes, mounting is straightforward. The mounting and finishing hardware are included so you’ll be able to mount the GCB-910 easily. It is also worth noting the GCB-910 mounting aligns with the pistol and ammo cabinets from Stack On. Of all the security features on the GCB-910, the three point locking system is one that stands out. The lock plate goes through the metal cabinet frame at the bottom and top of every unit. There is also a locking plate that is fastened onto the door panel and frame. The patented barrel rests are built for long term use. They will not compress or deteriorate as as quickly as those on other gun safes. The contours on the GCB-910 have also been designed so they can accommodate shotguns and rifles. And because it uses the proprietary Stack On barrel rests, your guns remain in place. The barrel rest also keeps the barrels off the cabinet’s back to avoid damage. The Blue Dot has a 14 bolts, 5 fixed and 9 live for extra security. Its plate is drill resistant and the design exceeds the DOJ requirements. The gun safe has the capacity to hold 30 guns comfortably, and it comes with 5 ammo pouches and 8 gun holsters. As should be obvious, there is a lot of room here for the gun enthusiast. You’ll be able to organize the guns and accessories without worrying about the space. This 650 lb gun safe has been rated fireproof up to 1700 F. There are not a lot of gun safes that meet this specification, and that tells you how durable the Blue Dot is. The body is made form 12 gauge steel and is going to hold up to long term use without wear and tear. The safe is heavy as it should be, and the interior has more than enough room for gun buffs. The baked finish looks good and adds durability, and the heavy door makes prying difficult. The deadbolts, finish and durability makes the Blue Dot an excellent choice to keep firearms safe. With several pockets and shelves, the Blue Dot is also suitable for storing documents, gold and other pieces of jewelry. Its fire resistance level is greater than those on a regular gun safe, and that is what makes this a good storage solution. Aside from the security measures that have been mentioned, the Blue Dot also has a drill proof plate. This means a burglar with a drill won’t get past it. The BCP gun safe has been designed to provide maximum security. Measuring 13.75”(L) x 11.25”(W) x 57.25”(H), there is room here for five rifles of various shapes and sizes. Inside you will also find plenty of space for bullets, ammo boxes and other accessories. The gun safe uses an electronic keypad to lock the content inside. Even if you have never programmed one before, the procedure is straightforward. The keypad is very secure and won’t open unless the right combination is punched in. In addition to the keypad, there are 4 backup keys that you may use. The keys are designed to open the safe as an override option. But you can also use it to manually lock the safe. The housing is made of solid steel and will not wear out even with years of use. The design is not only durable but stylish, allowing it to blend with other items easily. The solid design is not limited to the exterior though. Inside you’ll see it is carpeted to protect your guns from scratches. The carpeting looks great and the interior is as well made as the exterior. The interior is 13.5”(L) x 7.75”(W) x 6.75”(H) and at 99 lbs is not as heavy as those of others in the industry. This does not make it any less dependable though, only that it is easier to set up. The BCP gun safe is a nice compromise for those who need something bigger than a 2 rifle safe but smaller than those with a 30 gun capacity. Buying a gun safe is easy enough to do these days. With just a few points and clicks it’ll be shipped to your home. But considering what’s involved, you have to be careful abut what you buy and make sure that it meets your requirements. 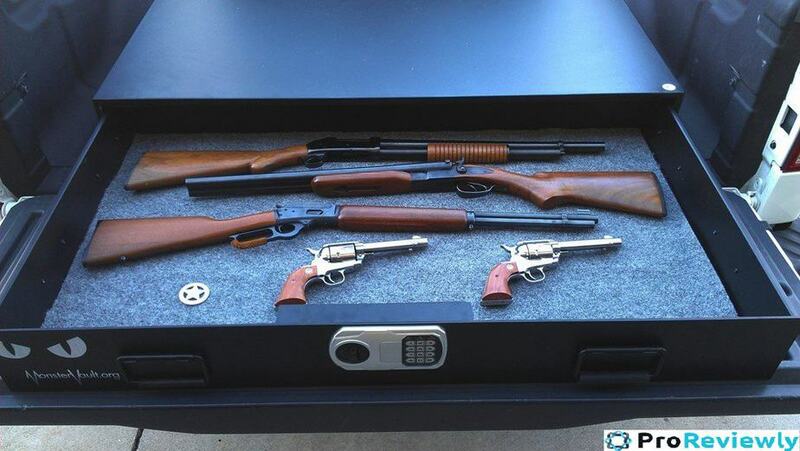 Gun safes can be divided into two types, for handguns and long rifles. If you own just one pistol, a single handgun safe will do. If you’ve got a doze rifles or more, get a large gun safe. It should have enough room for your long guns, accessories and pistols as well. If you’re thinking of buying another pistol or two, get a safe with a 3 to 5 gun capacity. Even if you don’t have a lot of pistols, you can use the extra space to store documents, jewelry and other valuables. A large gun safe can weigh up to 700 lbs and is delivered via a tractor or truck. Make sure that you’ve got the space for it before placing an order. And don’t forget to check your doorway to see if the safe fits. For handgun safes it’s all about portability. If you want to take your pistol with you, the safe must be portable without being flimsy. The more room a pistol safe has, the heavier it will be. There is no shortage of options here. Gun safes may use biometric fingerprints, electronic keypads, key locks, mechanical locks, bolt and key or any combination of these systems. If you opt for an electronic lock, make sure there are backup keys available that can override the electronics just in case. Durability is measured in steel gauges, and the lower the number, the thicker the steel. Long gun safes are stronger than handgun safes of course, but the quality of handgun safes have improved a lot. Aside from the gauge, look for live and active bolts, concealed hinges, fortified steel plates and anti prying. Long gun safes are usually fireproof, but the extent and durability varies from safe to safe. All good gun safes meet or exceed the CA DOJ requirements for a gun safe, and they are also built of heavy duty materials. You can check the product specs and that will give you an idea of how good the product is. The rule of thumb is thick doors, hard metal plates, lots of bolts, fireproofing, heavy gauge and fortified plates make for a good gun safe. A stealth mode that turns off any beeping sound. You don’t want to alert any burglars while you’re grabbing your gun. Gas compression strut: this allows for quiet opening of the lid to avoid alerting anyone. Security cable for mounting on walls or floors. All the 10 gun safes I have are of exceptional build, but some are just better than the others, as I mentioned earlier. If you own handguns, the Verifi Smart.Safe is ideal. It is easy to set up, has plenty of room for your pistols and offers peace of mind and security. The Verifi Smart.Safe also uses batteries very well. Are you looking for a long gun safe? Then the Steelwater is the one to get. I won’t repeat the features that I’ve already said in the best gun safe review, but suffice to say the Steelwater will keep your guns safe and secure.